Around 8,000 visitors each year experience the Muyil wetlands, mangroves, canals, blue lagoon, and local caves with Sian Ka’an Community Tours. On the occasion of the International Day for Biological Diversity, the world is celebrating the important role that sustainable tourism plays on biodiversity conservation and achieving sustainable livelihoods. The GEF, through the GEF Small Grants Programme (GEF SGP) implemented by UNDP, has been supporting community-based ecotourism for over two decades. The Sian Ka’an Biosphere Reserve is the largest marine protected area in Mexico, spanning more than 1.3 million acres of land and ocean in the municipality of Tulum, Quintana Roo, in the Yucatan Peninsula. In 1986 it was designated a UNESCO World Heritage Site in recognition of its rich biodiversity and wealth of Mayan culture. Sian Ka’an is Mayan for “where the sky is born”. While the Sian Ka’an Biosphere Reserve receives thousands of visitors every year, a few decades ago indigenous communities in the area did not benefit from tourism or investments in the local economy; they rather lived off the land through traditional agriculture and fishing activities that they had been carrying out for generations. To address this issue, and to help preserve the biodiversity of the Biosphere Reserve, the traditional knowledge of Mayan communities, and to help make their livelihoods more sustainable by protecting their environment, the GEF Small Grants Programme supported Community Tours Sian Ka’an through several grants from its Community Management of Protected Areas Conservation initiative in partnership with the United Nations Foundation. Community Tours Sian Ka’an (CTSK) formed an alliance of three sustainable ecotourism cooperatives that work directly with the Punta Allen and Muyil indigenous communities. CTSK began operations over 15 years ago, with just a handful of employees and a small numbers of visitors. Today, they employ 42 members of local communities to run the business, with almost 25% of them being women. Since then, developing a new industry has provided the local population with an alternative to environmentally destructive activities such as poaching and illegal logging. Job creation has reduced out-migration to large cities, encouraging investments in youth and long-term education, while helping to maintain the traditional knowledge of the Mayan communities. CTSK broke new ground by hiring the first female tour guide in the Sian Ka’an Biosphere Reserve, and continues to expand opportunities for local women by offering new roles and economic ventures traditionally reserved for men. 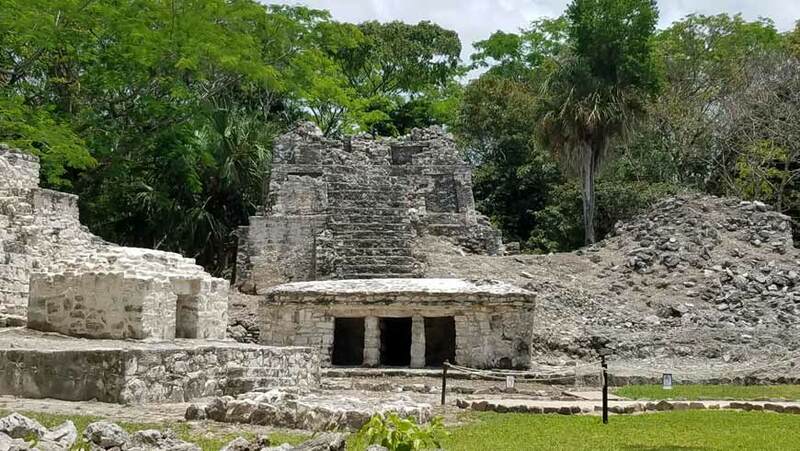 Visitors to Sian Ka’an can go on guided tours of the Chunyaxché ruins by trained local guides that are experts on the local culture and biodiversity. Since 2005, when the cooperative was just starting, up to today, GEF SGP support to CTSK has included the creation of a walking trail to avoid the use of motor boats that were causing erosion and destroying the biodiversity of the area when visiting the lagoon, wetlands and canals, building a museum and botanical garden to promote the knowledge and traditions of Mayan people on biodiversity conservation, and develop a menu of ecotourism services. CSTK currently receives around 8,000 visitors a year, who can experience the local museum and butterfly house, tour the Muyil wetlands, canals, blue lagoon, and local caves, as well as go on guided tours of the Chunyaxché ruins by trained local guides that are experts on the local culture and biodiversity. The also project also helped develop a website and marketing strategy for CSTK, an awareness raising campaign to prevent and manage fires, and supported the construction of hurricane resistant facility that can preserve local equipment and other goods of the cooperative. The effects of establishing such a cooperative among communities have been invaluable in terms of biodiversity and economic impacts. Investments in the region have allowed to reduce erosion in water canals by half, preserve globally significant biodiversity, and greatly improve local tourism practices. The organization has also been fundamental in reducing slash-and-burn farming, groundwater contamination, and hunting, and earmarks 5% of ecotourism revenues for local conservation activities. One of the important results of CTSK was to bring together different community-based tour companies reducing the competition among themselves and allowing them to professionalize their services and improve their standards for pricing. As a result, they were able to attract quality tourists and charge competitive tour prices, increasing revenue by 50%. By improving the eco-tourism services and facilities, the cooperative also generates employment for translators, operations coordinators, receptionists and managers with an emphasis on customer service. In 2006, CTSK won the Equator Prize of the Equator Initiative, a partnership that brings together brings together the United Nations, governments, civil society, businesses and grassroots organizations to recognize and advance local sustainable development solutions for people, nature and resilient communities, and recognizes the success of local and indigenous initiatives. That same year, CTSK earned a spot on the Condè Nast “Green List” for the high quality of their tours, and more recently, it received a certificate of excellence from Trip advisor.